The Blackhawks are the hottest team in the league, and the return of Duncan Keith and Jonathan Toews will only make Chicago more dangerous once the playoffs begin. However, for any hockey team to succeed, consistent goaltending is essential. This consistency is something the Hawks have lacked this season. Even though Chicago has gone 7-3 their last ten games, they have allowed nearly three goals per game during that span. Giving up that many goals to the opposition will not get the job done during the playoffs. This is Corey Crawford’s time to prove that he is No. 1 in Chicago. Crawford has been unstable, while Emery has done well when asked to fill in, but the playoffs are no time for musical-goalies. And I doubt the Hawks intend on playing it. This is why it is so important that Crawford be on his game. His playoff résumé is limited, and not very impressive. Although losing in seven games to Vancouver in the first round last season isn’t bad, a 0-1 showing in his only NHL playoff series is not great. This is especially true for a goalie whose team will have to be at their very best in every game in order to have a chance to go deep this post-season. It is not all on the goalie, however. 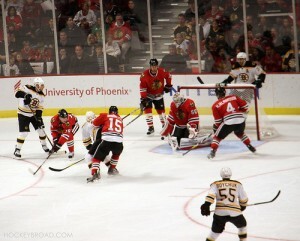 The defense will also have to help Crawford out of tough situations, and it starts with the penalty kill. A good penalty kill is key to the success of any team in the playoffs, and there is much room for improvement for the Hawks. Currently 28th in the league on the penalty kill this season, Chicago has displayed an obvious weakness for any team to exploit if the Hawks cannot improve. Although it is not yet decided what seed the Hawks will have or who they will face in the first round, Crawford (with help from the defense) will have to be on his “A” game and continue to grow as a playoff goaltender in order to help his team advance.